Based on his stats from the past 30 days, he is currently ranked 64th with 143.8 total points (1.78 avg). His average points in the past two weeks have increased by 1.6 PPG. Top 75 in goals with 2, though that isn't saying much, and is currently ranked 55th among C.
Top 75 in assists with 3, though that isn't saying much, and is currently ranked 65th among C.
Ranked 187th in +/- with -5. Top 100 in shots on goal with 11, though that isn't saying much, and is currently ranked 97th among C.
Top 50 in time on ice with 18:07:37.5000 and is currently ranked 37th among C.
Top 75 in total penalty minutes with 4, though that isn't saying much, and is currently ranked 55th among C.
Ranked 147th in blocked shots with 1. Top 13 in powerplay goals with 2 and is currently ranked 11th among C.
Ranked 47th in powerplay assists with 1. Ranked 39th in faceoffs won with 78. Experts rank this player at 9th among C's. Based on his stats from the past 30 days, he is currently ranked 26th with 260.9 total points (3.18 avg). Slight decline in numbers lately at 1 PPG. Top 35 in goals with 3 and is currently ranked 35th among C.
Top 100 in assists with 2, though that isn't saying much, and is currently ranked 86th among C.
Ranked 185th in +/- with -5. 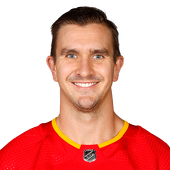 Top 10 in shots on goal with 41 and is currently ranked 7th among C.
Top 35 in time on ice with 18:42:55.0000 and is currently ranked 31st among C.
Top 15 in total penalty minutes with 10 and is currently ranked 14th among C.
Top 50 in blocked shots with 7 and is currently ranked 46th among C.
Ranked 39th in powerplay goals with 1. Top 28 in powerplay assists with 2 and is currently ranked 26th among C.
Ranked 45th in faceoffs won with 73. Ranked 51st in hits with 12.